Crispin Weston, who describes himself as "a controversialist", suggests that our outlook is not progressive at all. "... when we look at education technology, we find that almost nothing has changed at all." In principle, these are exciting times, writes Crispin Weston. Having spent the first three years of its administration backing away from any active involvement in ed-tech, the government now appears to recognise not only that ed-tech has an important part to play in improving educational provision, but also that the government has an important part to play in making that happen. In practice, I do not believe that the ed-tech community has yet taken advantage of the opportunity it has been given. The latest edition of Digital Education is bursting at the seems. There is, I hope, something for everybody. As well as news and commentary, there are lists of resources, evaluated. Plus, guest articles: Professor Paul Curzon considers what programmers can learn from magicians, Sal McKeown asks whether we really need teachers, Crispin Weston suggests what is wrong with the Education Technology Action Group, Geoff Jones points out the dangers of some forms of data collection from parents, and Derek Blunt has a (mild) rant about the demise of the term “teaching”. 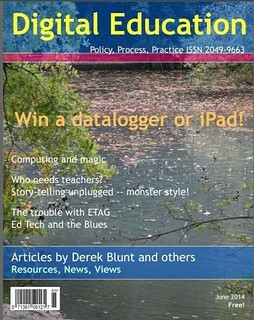 There are other articles too, plus a chance to win a Labquest datalogger, and a chance to win a break in Germany, an iPad and other goodies, free entry to an event called Digital Summer Trip, access to a growing list of very useful resources, including the collated articles about the recently-announced Department for Education assessment innovations. The full list of contents is given below. Do you know, I hate those self-referntial blog posts in which bloggers talk about their own blogs. So I’m not going to do that; I’m going to talk about my newsletter and a survey instead! I am always suspicious of things that everyone agrees about – mainly because I usually find myself disagreeing. I would not be so arrogant as to believe that everyone else is wrong and I’m right, but I do often think that it would be good to evaluate what is taken as read in light of our personal experience and pedagogical expertise. Here are just three examples of what I’m talking about. A school that says they are implementing a tablet programme is doomed to failure. You can substitute “ipad”, “Bring your own device” or some other similar kind of term for “tablet”, the result is the same. Independent consultant and self-confessed “controversialist” Crispin Weston offers a personal view of the current educational technology landscape, and what needs to be done to transform it. Modern research still confirms the vital importance of students receiving timely, actionable feedback, the essence of “dialogic” teaching. But the amount of such personalised feedback in most schools and colleges is extremely limited. Do you have anything you’d like to add to the discussion, Terry? The scene was a meeting at the Edusummit conference at UNESCO in Paris in 2011. The question came from the Chair. Thank you, but no: everything I was going to say has already been said. Be silent, unless what you have to say is better than silence. The question is: does that make me a good collaborator, or not so good? How do we measure such things? And does any of it matter anyway?